Where has four years gone? It only seems like yesterday when Bees supporters started licking their lips saying “We've got Graham Stack in goal!” Despite being offered a new deal from Manager Martin Allen “Stacky” is moving to pastures new. Graham was born in Hampstead in 1981 and as a youth joined Arsenal signing professional terms in July 2000. He represented Republic of Ireland 7 times at Under 21 level and he made 5 appearances for the Gunners, spending time on loan at Beveren (Belgium) and Millwall before joining Reading at Christmas 2005. After a short spell at Plymouth Argyle and further loans at Leeds United and Wolverhampton Wanderers he made over 60 appearances for Hibernian in the SPL. Stack – Fuller, Brown, Saville, Fortune – Weston, Yiadom, Byrne, Lee, Holmes, Hyde. He is another who will go down in Barnet folklore (and some) playing in the final ever game at Underhill against Wycombe Wanderers later that season. Will we ever forget the emotion of his magnificent injury time penalty save? 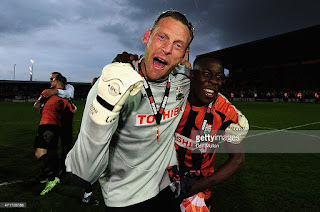 Arguably the best ever Underhill moment saved until the very last! Now in the Conference Premier , Graham was given the club captaincy after the departure of Player-Manager Edgar Davids in January 2014. The Bees, helped by the outstanding work of Graham week in week out consolidated a League position to set up the assault on the title in 2015 under the guideline of Martin Allen. However it was not only on the pitch Graham's expertise was used – it transpired he was a natural Coach and confidence builder especially for the younger players. Jamie Stephens tells me “Since day one at the Hive Graham has been nothing but supportive. Without his guidance I would not have won the Player of the Season award. He has had a very tough year with injury and no-one must underestimate his role and his input at Barnet. He pushed me through every game. Whoever signs his will get an excellent Coach and most importantly a top person who will get the best out of everyone around him”. Offered a new deal by Barnet, Graham obviously felt he has the fitness levels to continue playing on as a first choice Goalkeeper for a while and I know all the Barnet supporters will wish him every success in the future – he did become “one of our own” in my opinion and also in the opinion of Martin Allen who said “I was sat in his house one Friday night from nine o’clock until quarter to twelve, trying to persuade him to stay” That's how much the Manager values his qualities. 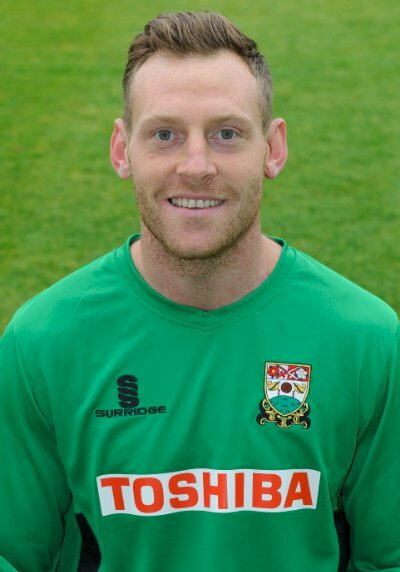 In all Graham made 134 appearances for the club and has gone on record with this statement “After four fantastic years I leave Barnet Football Club. A club close to my heart, a club where I have enjoyed so many special moments, shared with a great group of supporters I have loved playing for. I must thank the manager Martin Allen who I have worked closely with for over two years and learnt and improved not only as a coach but as a person”. A precious memory for me personally involving Graham was after the passing of my dear friend the much missed Barnet supporter “Donny Gaz” – a minutes applause was held during the match against Macclesfield Town and at the final whistle Graham removed his shirt to reveal “Donny Gaz RIP” on his vest, beautiful moment.